Alexandre Panosso Netto and Guilherme Lohmann, "Tourism Theory: Concepts, Models and Systems, 3rd edition"
Theories within tourism can be difficult, even confusing areas to understand. 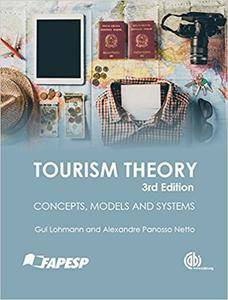 Developed from the successful Portuguese textbook 'Teoria do Turismo', Tourism Theory provides clear and thorough coverage of all aspects of tourism theory for students and researchers of tourism. Consisting of five sections and over fifty entries, this book includes nine of the most important models in tourism study. It begins by reviewing general concepts, disciplines, and topics, and then considers the tourist, including areas such as demand, experience, gaze, psychology and typologies. A fourth section covers intermediation, distribution and travel, reviewing aspects such as travel agencies, tourist flows and multi-destination travel patterns. The final section encapsulates the tourism destination itself, covering organisations, the destination image, supply, seasonality and more. Encyclopedic cross-referencing between entries makes navigation easy, while in-depth analysis, exercises and further reading suggestions for each of the selected areas provide the context and detail needed for understanding.Entries can be used individually as a reference, or as part of the whole for a complete introduction to tourism theory.